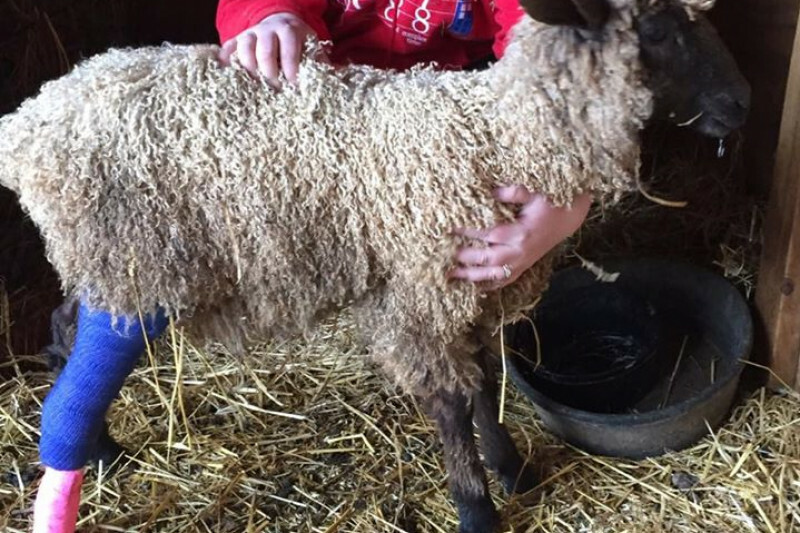 Rachel is a sweet, beautiful little 6 month old 80% Wensleydale ewe lamb who has had fought hard to overcome some bad problems from the day she was born. Now, when she is finally thriving, she has broken her right rear tibia bone and needs surgery at the New Bolton Veterinary Center to repair it properly. She was the third born in a set of triplets. The first lamb was so badly presented that he died before birth and had to be delivered by a vet, who did not expect any other lambs to be alive. But a strong black ram lamb and then a vigorous Rachel followed. She is a beautiful ewe lamb with what appears to be a silver fleece, very rare. At three months old, she fought off the dreaded barber pole worm. She needed a blood transfusion to recover. One month later, she developed coccidia, and became thin and to keep her out of the bitter cold and wind we were having, till she got stronger, she lived in tarp lined room in nice warm basement. Since then, she has been growing and thriving. She has a typically beautiful Wensleydale fleece, with a five inch length and all the luster you could hope for. Christmas Eve morning, she was found with her right rear leg dangling. A trip to my great local vet confirmed through X Ray that she had a badly broken tibia. It was in a very bad place to get to heal with just a cast. It was casted, though, to get her through Christmas. Today, after talking to orthopedic surgeons at the New Bolton UPenn Veterinary Center the decision was made to give her the best possible chance of a good recovery, she will have surgery there on Thursday Dec. 28. The surgery and after care is estimated to be $1,800.00 We have already put almost $900 towards her safe veterinary assisted delivery and then a blood transfusion and after care and another $500 at the vet on Christmas Eve. We are committed to this surgery, but could sure use some help. We just got back from Rachel's leg check at New Bolton. The surgeon was extremely happy with the way the bone had healed. Lots of bone callus formed around the facture. He was comfortable removing the pins and cast. 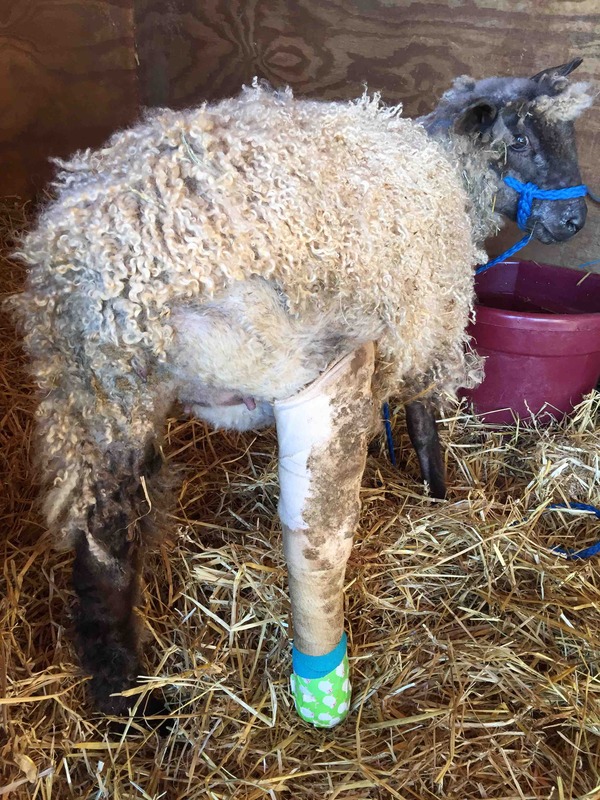 She is now in supportive soft bandaging as she gets used to using the leg. We wrapped it in sheepy duct tape to prevent it from getting too wet or mucky. Stall rest for two more weeks. If she is using it alright, the bandaging can come off in one week. The surgeon wrote on her paperwork today "Prognosis: Excellent"
As the days go by, Rachel is getting stronger. She has begun to move her leg at the stifle instead of just swinging from her hip. She is developing muscles and continues to amaze us with her determination and resilience. 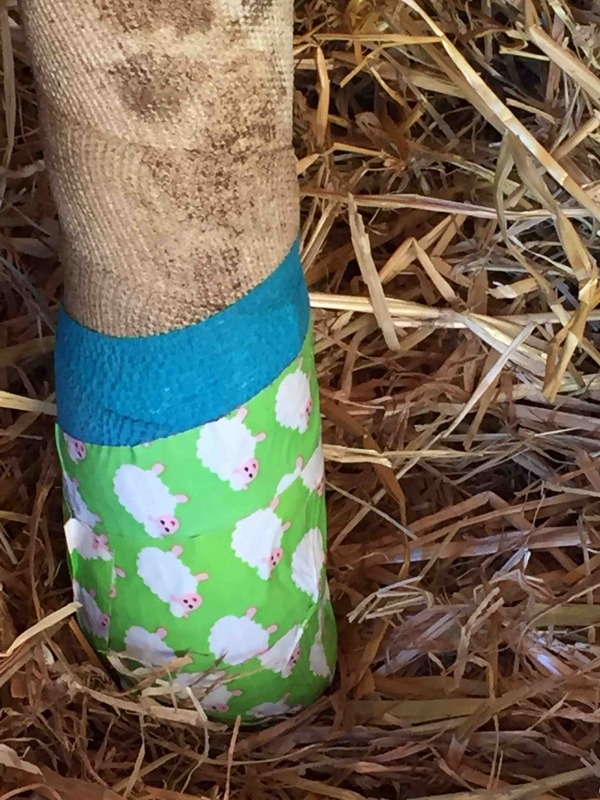 We replaced the lower padded part of her cast with some nice teal vet wrap and sheepie duct tape. Now she has style! Thank you all for your donations, prayers, and thoughts. It was taken by a reporter for the Carroll County Times, who did a story on Rachel. The fund really took off when Rachel made the front page of the paper on Saturday. Thank you to all of the wonderful, kind people who have donated to Rachel's surgery and recovery fund! We have met our goal for the cost of the initial casting and the surgery on Dec. 28, which is amazing ! 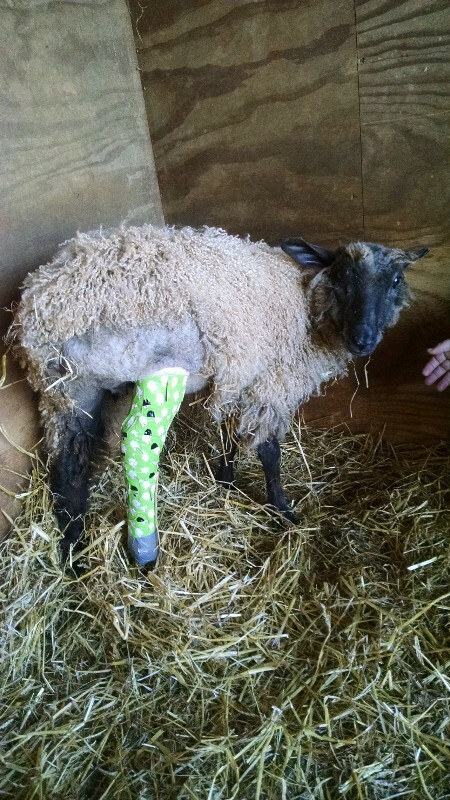 Any additional funds will now be used for the costs of the follow up care as X Rays need to be taken to monitor her recovery, her cast will need to be changed, as she grows, and pins need to be removed. The surgeon is hopeful that by the time spring is here, she will be ready to live a very healthy and happy life with people who love her very much!